In his latest video, an Ohio bee removal specialist who goes by The Bee Man liberates a derelict Chevrolet El Camino from the huge nest of a swarm of giant European hornets, which have creepily taken the form of a driver in the car that has rendered me forever unable to trust anyone in an El Camino. In the description of the YouTube video below, The Bee Man explains that these European hornets can get as big as two-inches long, and near the end of the video he pulls out the queen of the swarm, which is even bigger than the rest of them. I would say I am someone with a natural, healthy level of fear of bees and hornets and the like, but seeing something like this elevates that fear to a new level of sweaty palms and tensed muscles. 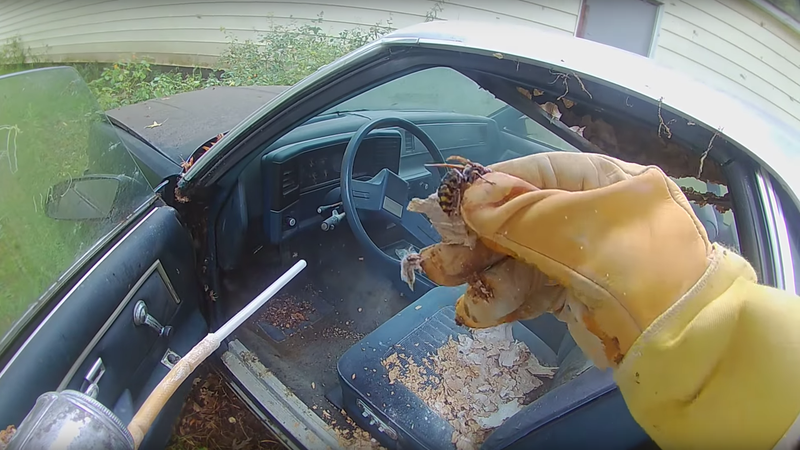 In the video, The Bee Man stabs the nest with his smoke gun in multiple areas, pumping it full of the stuff and driving the majority of the hornets into a frenzy surrounding the car while he begins to rip their home apart. A few minutes in he realized he came underprepared and gently comments that he’s “gonna need a bigger bag.” If it were me, I would bring an armored car to transport that thing. An armored car I wouldn’t mind driving into the bottom of the lake, never to be opened again. You can’t take any chances. How Much Weight Does a One-Pound Bee Inside Your Car Add?